Late last night after marveling about the incredible NBA Finals, I tweeted a seemingly random baseball question about 3 teammates each hitting a double and triple in the same game, and thought that I could probably figure out the answer myself if I really wanted to do so. I was eventually able to thanks to some help from Baseball-Reference’s Play Index Tool. What I discovered turned out to be a hidden gem: a true rarity in the MLB. Boston Red Sox players Brock Holt, Alejandro De Aza, and Mookie Betts each doubled and tripled in yesterday’s 9-4 victory over the Braves in Fenway Park, becoming just the 11th trio of teammates to accomplish the feat in Major League Baseball since 1914. There are a lot of other crazy things that happened in the Sox win yesterday related to this accomplishment. First of all, though it was all over NESN and ESPN, Brock Holt hit for the cycle, becoming the first Red Sox player to do so since John Valentin in 1996 (in between those Sox cycles, the team pitched 4 no-hitters and won 3 World Series). In case you were wondering, this is the first time in MLB history (since 1914, at least) that a player hit for the cycle and 2 of his teammates (Betts and De Aza) each hit a double and a triple. Mookie also ripped a single to left-center in this game, which put him a homer shy of the cycle…no 2 teammates have ever hit for the cycle in one game. In fact, of the 245 cycles in the MLB in the last 100 years (hit by 220 different players – 21 did it twice and 2 cycled three times), no two occurred in the same game. Furthermore, yesterday’s Sox game was just the 2nd time 3 players from the same team doubled and tripled in the same game since 1978. The last group of teammates to achieve this: Bryce Harper, Anthony Rendon, and Danny Espinosa for the Washington Nationals in their 9-2 win on the road against the Miami Marlins on April 14, 2014. As can be seen below, this wasn’t the first time that two different teams accomplished this rare achievement in consecutive years, as the Detroit Tigers (only team to do this twice, both against the Washington Senators) and Cincinnati Reds did it in 1925 and ’26, respectively; then a few years later, the Cleveland Indians (also at Fenway Park) and Chicago White Sox did the same in ‘29 and ’30, respectively. The Red Sox trio of Betts, De Aza, and Holt became just the 11th group of 3 teammates to each hit a double and triple in the same game. 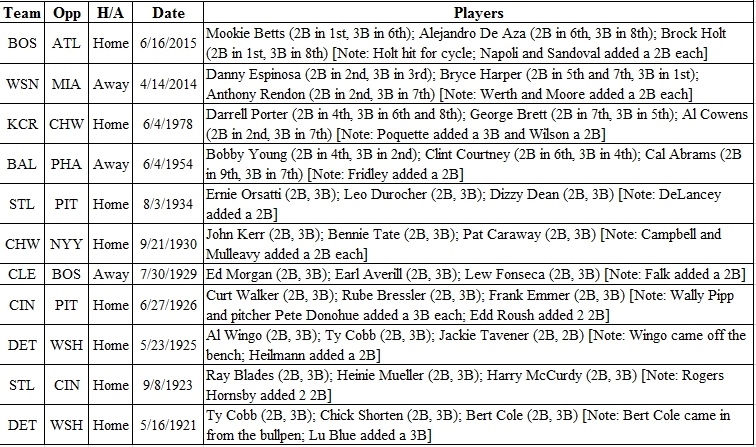 A quick note here: not only did 3 Detroit teammates achieve this feat in that May 1921 game, but also 2 Senators players (top spots in the lineup Joe Judge and Duffy Lewis) each did so (plus 2 other teammates each hit a double, and 2 different ones added a triple each). Looking at the list above, Bryce Harper is the only player among the groups of 3 teammates to knock 2 doubles to go along with his triple. Even more impressively, Darrell Porter of the 1978 Royals is the only guy in all the successful trios to hit 2 triples to go along with his double. Because the innings in which the hits occurred are not available for any of these instances before 1934, I cannot say as much about the timing of these accomplishments, but I can for those first four. Of the 4 most recent occurrences, both sets of teammates for the Royals and Nationals completed the rare feat by the 7th inning (Cowens’ and Rendon’s triples were the clinchers), while the Sox took 8 innings (both De Aza and Holt hit their triples in the 8th), and the 1954 Orioles had to wait for Abrams’ double in the last frame. Of these instances, Danny Espinosa’s contribution was quite remarkable and rapid as he fittingly doubled in the 2nd and tripled in the 3rd. Incredibly, of the trios of teammates listed above, 3 include pitchers: starters Dizzy Dean and Pat Caraway as well as relief pitcher Bert Cole. Of course, all three of those guys pitched in an earlier era where pitchers were not quite so bad at hitting as they are today. Caraway and Bennie Tate are also the only Pitcher-Catcher duo within a set of 3 teammates above. Interestingly enough, every trio has at least 1 outfielder and 1 infielder (or Pitcher/Catcher), which means that there has never been a group of 3 outfield teammates or 3 infield teammates to each hit a 2-bagger and a 3-bagger in the same game. However, yesterday Betts was playing CF, De Aza was in LF, and although Holt played 2B he easily could have started in RF over Rusney Castillo, which would have made this rare achievement an even more unparalleled one. Still, it’s pretty crazy how very infrequent these kind of things happen, which is why I say it’s always worth digging deeper.